Long days of standing or walking take their toll on tired legs and feet, so protect yourself with a pair of Thorlos Support Work Wear Socks, made for maximum protection while wearing work footwear. Extra spandex provides light compression in the calf and reduces fatigue from constant standing, while targeted padding in the ball, heel and extended heel is placed at weight-bearing areas for demanding work, clinically shown to reduce blister, pain, pressures and moisture. 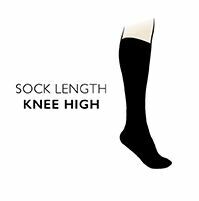 These US-engineered and made over-calf socks have low profile toe seams to avoid rubbing that causes blisters, and a cushioned arch improves fit while lessening pressure on the feet for more comfort.